While traditional Mexican costume is, unfortunately, disappearing throughout Mexico, there are many who continue to preserve the indigenous dress for history and hope that it might be seen more frequently than just on national holidays. There is no one style of dress that can be absolutely deemed as "traditional" Mexican costume because of the complex history of the country. Perhaps Mayan clothing as it was created and worn prior to the conquest by the Spanish is the most truly traditional, but arguments can also be made for what is variously called peasant dress, puebla dress, folk dress, folklorico and campesina, among other terms. Once national dress took on Spanish stylings, it continued to evolve in various ways from state to state. There are a few looks for both men and women that can be called traditional, and much depends on where you come from and what era you are trying to represent. Traditional Mayan clothing is colorful and comfortable. For women, dress consists of a blouse called a huipil, which is a simple square of fabric with a hole in the center. It is embroidered around the neck and then folded in half and stitched at the sides. The embroidery tends to be very elaborate and meaningful. The designs represented the cosmos, gods and their helpers. The woman wearing a huipil thus becomes part of this universe. The blouse is worn over an equally colorful skirt and tied with a woven belt. Another part of women's dress is the tzute, a rectangular piece of fabric that can be worn as a shawl, cape or even fashioned as a sun hat. Jewelry is often common, consisting of beaded necklaces, rings and earrings. Men's dress was quicker to take on more Spanish influences for a variety of reasons. The traditional embroidered loincloth is still seen, but as a sash or belt (think Zorro). Their shirts may still be woven in traditional colors and fabrics, but they take on collars and other more European aspects. A man might also wear an embroidered tzute over the shoulder. Hats are common, usually made of straw and decorated with ribbons or pompoms. When most people think of traditional Mexican costume, they are really visualizing Puebla-style clothing that was influenced by the Spanish colonizers and later became the basis for bohemian dress in America. This would be the loose dress or blouse with a square cut neck and short sleeves. It is usually white or off-white and decorated with a lot of embroidery. The neckline is edged in braid or embroidery and the bodice is colorful. This is also the basis of what can be called the folklore or folklorica dress worn by dancers. The difference is that this dress is far more colorful. The blouse might be pink or yellow with contrasting color details. The skirt is long, flared and multi-tiered with ruffles and a variety of color. This is very different from the standard Mexican skirt, which is rectangular and wraps around the body with the loose end tucked in. The man's folklorico costume consists of a wide hat called a sombrero. While sombreros worn traditionally by peasants are woven of plain straw, the sombreros used for performance or celebration tend to be felt and in bright colors - perhaps a red base with green and gold trim. The rest of the costume consists of long trousers decorated at the sides with bright trim, a short jacket in a contrasting bright color and a ribbon bolero tie. A sash is worn at the waist. 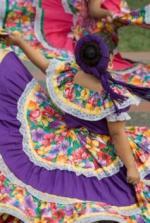 If you wish to make a Mexican costume, there are many websites with further information and patterns. Ultimately, what matters most is the embroidery. Although the Mayan religion has mostly been supplanted, meaningful embroidery, beautifully designed, is still the heart of Mexican clothing.